Richmond fans will talk premierships after knocking off Carlton tonight. If you know a Richmond supporter, just bite your tongue and remember that their membership will most likely be in the microwave next month. Let them have it for one night, they’ve suffered enough. Neutral supporters will tip Melbourne to win, and then complain that they’re already behind in the tipping when they get flogged by more than 40 points. Carlton fans will reassure themselves that their young players are developing and that it’s only a matter of time until they deliver the goods. That number one pick, Bryce Gibbs, it’s only a matter of time until he reaches maturity. Sportsbet will be inundated with the usual pigeons placing premiership and brownlow bets after one game. Hawks fans shouting ‘Fourthorn’ whenever they get near the goals. This will hopefully be a fad until they realise that they’re on the skids this year. Short term pain, people. Unfortunately they’ve earned the right, so we have to wear it for now. If you happen to know a North Melbourne supporter, that’s unlucky for you. Just remember, they have their tails up this year. They’ll probably win this weekend, so be prepared to tolerate a good ear bashing about ‘Boomer’, ‘Goldy’ and ‘Lindsay’. Sometimes it’s easier to just walk away, but if you must stay, just get your phone out and YouTube the 94 preliminary final. It will either piss them off or divert the conversation elsewhere. Either way, you’re winning. Bombers fans will be extra quiet this weekend. Actually, we won’t hear a peep out of them all year. Comfort them. Tell them that as a Geelong supporter you are here to help. We’ve given them Chappy, Stokesy and Kelly. We really mean it. We also gave them Dank and Robbo – maybe steer clear of that one. Supercoach ‘experts’ bragging about which recruit they picked up when everyone knows they probably watched one NAB Challenge game and slapped their side together by looking at Jock Reynolds’ cheat sheets. So yes, Monday afternoon is upon us. A danger game, pardon the pun. The new number 35 linking up with ‘ol’ Captain my Captain’ Selwood is something every Geelong fan should be salivating over. If Zac Smith’s NAB form in the ruck is anything to go by, one hopes that our centre clearance woes from seasons past are as dead as Mick Malthouse’s coaching career. The Hawks have their worries. No Roughy, and Hill is out. They touched us up last year. A 10 goal plus hiding in round one was embarrassing as it was haunting. That won’t happen again. The Cats will be fielding their best side for round one, with a host of new recruits and old heads returning from injury that are almost like new recruits. Vardy. Menzel, Duncan, Stanley, anyone? 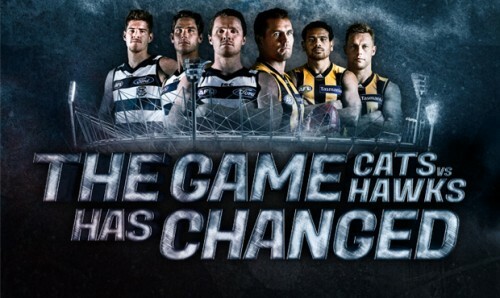 The only issue for the Cats will be that they haven’t had time to gel, as the punters continue reminding us. In other words, we’ve got a bucket load of good players ready and firing, but they just haven’t bonded yet. One can think of no better way of bonding than beating the Hawks in the season opener. As we anticipate the big game, Cats fans, enjoy this beautiful clip from round 19, 2012.